- In order to get this quest you need to start getting random Minutemen quests from Preston, achieved by settling down in Sanctuary and starting a settlement. Eventually he’ll throw this one out to you. - The nearest Settler is likely to be the quest giver, and he’ll plead with you to rescue his son from some kidnappers. 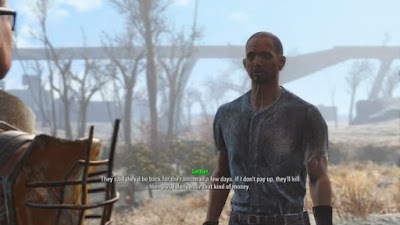 You have the immediate option to pay the ransom for the dude, a hefty 400 caps; otherwise you’ll have to go looking for the kidnappers on your own. (Don’t pay. That’s lame. Take them down.) Agree and he’ll mark their supposed location on your map. 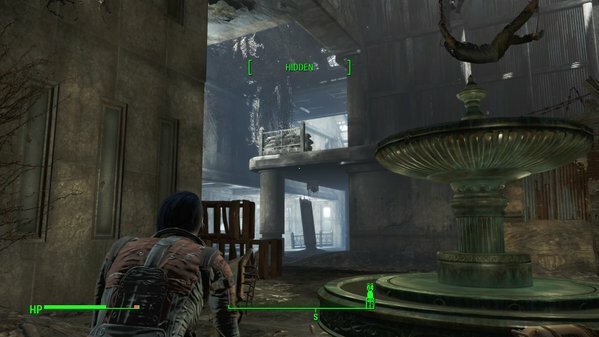 Monsignor Plaza in Fallout 4. It was probably pretty at some point. - The location of the kidnappers is Monsignor Plaza, found to the southwest of County Crossing. As you might expect, you’ll run into trouble if you take the direct route there from County Crossing, across the nearest bridge to the west. There’s a small band of Raiders on the other side of the bridge, camped out in some of the buildings, and as you approach the freeway that sweeps over this part of Boston you’re apt to run into a few Super Mutants. Watch yourself. - The majority of Monsignor Plaza is indoors, but there are opponents to face outside as well. If you approach from the north you’ll find the street in front of the Plaza guarded by a number of Raiders, most of which hang out beyond your immediate reach, as well as a Turret raised out of arm’s length. (A terminal by the front door can turn the Turret off, but the chances of doing this before engaging it are slim.) Take out the Turret to lure the Raiders into view, then blow ‘em away. You can also enter the Plaza by sneaking around the sides of the building (the east side offers more space to move) and find a rear entrance that’s unguarded. We’ll proceed from the front door. - There are four Raiders near the front entrance. Two are through a hallway ahead and on your right a bit, along with a Turret; the other two are on an upper level. If you kill the one that’s patrolling you should lure the rest into engaging you. The more you kill the more will start to show up, and if you stay in this general area, watching the Turret (or the remains of the Turret) pretty much everybody in the vicinity should show up and easily get blown away if you wait long enough. - Take a right from the Turret killing ground and you can find a side room with a hole in the floor. Drop down through it and you’ll find a series of connected stores, the first of which contains the Settler. Assuming you’ve killed everyone, set him free and he’ll follow you around. Don’t set him loose ’til you’ve cleared the building or you might get him in trouble, and he might get you in trouble, and… yeah. - Through the rooms on your left from the Settler is a hallway connecting the stores. You can find the back entrance here. If you’re sneaky you can use the back entrance to grab the guy and shepherd him through this door without the Raiders elsewhere in the building being any the wiser. You can also distract them by activating the Protectron back here, as it will wander around the Plaza and get their attention. Don’t let it see you attack people, though, as the Protectron will happily shoot at you, too. - There are two upper floors to explore. The third is largely reachable via a set of stairs to the right of the Turret killing ground; there’s another Turret at the top of the stairs, on your direct right, and likely another Raider straight ahead. The first store on your right is a weapons shop, and has lots of nice ammo-related items; it also contains a terminal with the Griswold’s Poetry Collection Holotape. Read it. At the end of the hall is a nice ammo box, as well as another terminal. It’s relevant to the Holotape. Just saying. There’s an exit to street level here, though you need to pick an Expert lock (and brave Rads and lots of dangling can traps) to get to it. - The fourth floor can only be reached by the elevators on the ground and bottom floors. The first (and only) store on your right contains a bunch of mechanical goodies; other than that and a Weapons Workbench, there’s not much to see up here besides a door to the roof. There’s a Raider up here, and… yep. Yay. - Travel back to County Crossing with the Settler to get your reward. (Just fast travel. Trying to move with this guy is too annoying.) This will allow you to cultivate County Crossing into a settlement, if you like. Return to Preston, wherever he may be, for your reward. I went to County Crossing and found the dude's friend who asked me to save him, (as it turns out you can get this quest from 5 different settlements). At my point in the game the only thing Preston wants to talk about is taking back the castle. In my quest he was held at Faneuil Hall, where there are no back doors! Up 3 flights with Super mutants all the way.